As many parts of the world are fighting scorching heat waves and fire outbreaks, several weeks of extraordinarily heavy rainfall in the northern region of China have collapsed a newly renovated section of the Great Wall of China. This disaster was 'not' a failing of the ancient builders but, according to some experts, it is a direct result of shady recent repairs on the centuries-old mega structure, reported newspapers last week. The Great Wall of China was listed as a World Heritage site by UNESCO in 1987. It spans 15 provincial areas and ranges about 13,000 miles (21,200 kilometers) and was initially built in the 7th century BC to protect the Chinese Empire from invaders. The recently damaged section of wall has been closed since July 22 and local tourism authorities are “taking emergency measures to repair the section" according to a report in the Daily Mail . Located beside the historically significant Yanmen Pass in Dai county, Shanxi province, the mountain pass, which was once an important trade route, was built during the Ming Dynasty (1368-1644) in the Yanmen Mountains, 12 miles (20 kms) north of Dai county. A faction of specialists has now spoken out suggesting that recently completed renovations on this particular part of the Great Wall were sub-sufficient and weakened its foundations, which subsequently led to it being more vulnerable to the effects of erosion, leading to its eventual collapse. The critical article was published by a citizen journalist account Xiaozhanbianjibu and said 'Sometimes, I would be thinking, why you [people renovating the Wall] can't take your job more seriously. Why can't you devote all your energy in repairing the wall?' A Global Times article said the paper "struck a chord with many netizens who are unsatisfied with the shoddy renovation projects along the Great Wall, which are reported to be rampant all over the country. 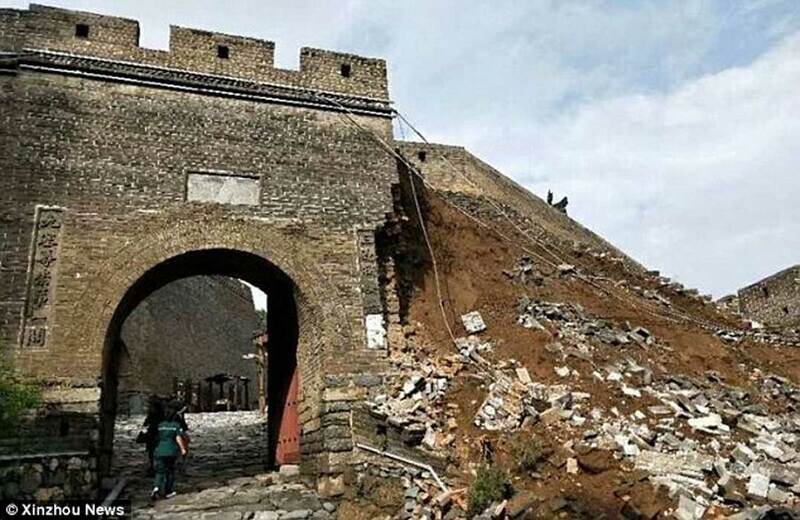 If this monumental disaster was not enough, the Daily Mail also reported that an article on WeChat recently claimed that "another construction site of the Great Wall along the Yellow River had collapsed due to heavy rainfall and construction." And this is not the first time Chinese authorities have come under attack for these practices, for example, in 2004 Xinhua reported that in the Baiyangyu section of the Great Wall at Qianan, Hebei Province, the construction team painted a large section of wall white. What is more, in 2016, a repaired section of the wall in Liaoning province was covered over with "smooth cement," sparking outrage among the local Chinese people. The local tourism administration later added fuel to raging fire by explaining this had been done to 'make it more suitable for tourists to walk on.' Seriously, he said that. China's efforts at increasing tourism seem to be reaching monumental proportions, evident in a recent article in The Independant which revealed the disruptive technology giant, Airbnb, recently launched a competition to win four tickets to stay overnight on the historic wall in a custom-designed house. To win this unique Airbnb experience, contestants have been challenged with writing 550 characters explaining "why they consider it important to break down barriers between cultures and how they would use their time at the Great Wall to build new connections," according to a report in Global News . After "a short hike to the unique sleeping quarters," guests are given a gourmet cultural dinner, with the culinary traditions and food rituals of the ancient Chinese people including a traditional Chinese music concert before bed. And to put China's tourism drive into perspective, financially, a Pie News article explained that since 2012, China has been the number 1 global spender in international tourism and has led global outbound travel, and a vast portion of this revolves around the Great Wall of China. In fact, as of 2016, China accounts for 21% of the world’s international tourism spending, or $261 billion. With so many hundreds of restoration projects, it is easy to understand why some unobserved contractors would use duct tape and bubble gum to get things finished so that they can get on with their next job. Brings a tear to my eye.